Fuel Consumption 12 to 25% Reduction! The GK-G exhaust gas heat recovery unit works with a composite boiler to recover the waste heat from the G / E for use as a heat source. It can contribute significantly to saving space and reducing fuel costs. Air pollution regulations in the IMO MARPOL Convention have resulted in changes in the conditions for exhaust heat recovery, and in future, it is anticipated that the amount of steam produced will be insufficient. The GK-G makes effective use of the normally unused exhaust heat from auxiliary generators, enabling it to be used as a heat source. 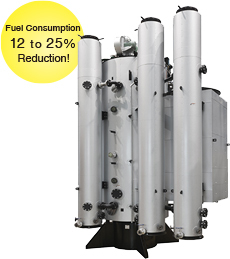 The exhaust gas heat recovery unit uses simple vertical flue tubes. Individual exhaust gas heat recovery units are installed on each G / E, and the exhaust from the flues of the G / E passes through the series of smoke tube in the unit where heat exchange takes place. The unit water is shared with the boiler water through linkage with the auxiliary boiler, enabling central management of water quality. Waste heat can be recovered from G / E whether the ship is stationary or moving. educes fuel consumption by 12 to 25%. The amount of heat recovered from G / E is 10 to 30% of the heat recovered from the M / E.
Highly flexible layout.Installation is possible, regardless of the weight and size of the boiler. Despite its compact size, the GK-G is equipped with a jointly developed built-in silencer which provides effective muffling with little pressure loss.